Hello PMB friends! 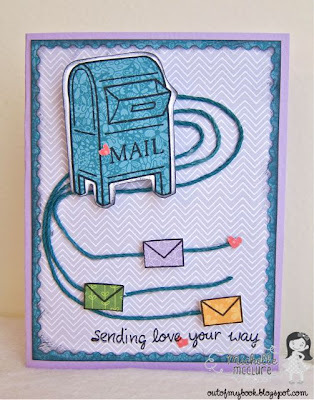 This is Michelle here today to share a card made from April's Fresh Baked Kit. I thought for this one, I'd stick to the appointed mail theme and see what I could do. I stamped the mailbox and envelopes from Lawn Fawn's "you've got mail" set onto their petite patterned papers. I just love all the colors in the pad. 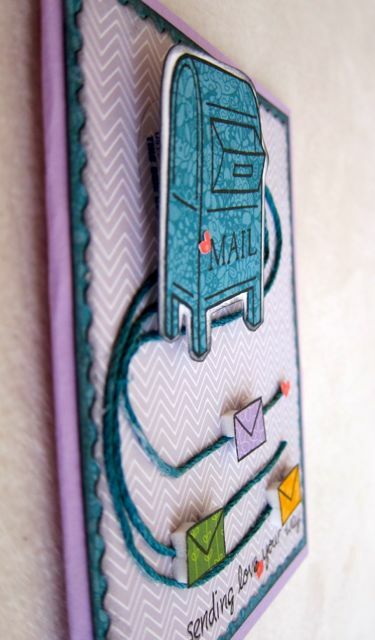 I adhered my blue mailbox onto the white mailbox Silhouette die cut that is included with the embellishments, and popped that up with 3-D spring, also included. I've never used that little contraption before, and it is so fun! The mailbox springs around when you just slightly move the card. I used Fabric-tac to adhere three strands of the natural hemp cord onto my background to create the movement of the wind blowing the envelopes from the mailbox to the recipient. I love how it turned out! I think all the contents of the "Walk on the Bright Side" kit are so well coordinated, you just can't go wrong with anything that you make. I'll let you in on a little secret. The person who actually designed this card is my hubby! I was working from the hotel room and asked him what I should make and he quickly drew out a sketch of this card for me. But don't tell him I told you. Loveeeeeeeee this!! LOVING the added hemp cord!! Love the card! How great for you that your husband was willing to help with a sketch!